This post was meant to be a list of descriptions of brass production in medieval texts, but as soon as I opened Mappae Claviculai, it became clear that each text will need it’s own post. The history of brass is complex, and it defies 21st century ideas about metallurgy. Metallic zinc was almost unknown in Europe until the early modern period, but its alloy with copper – brass – was in high demand in antiquity and the middle ages. 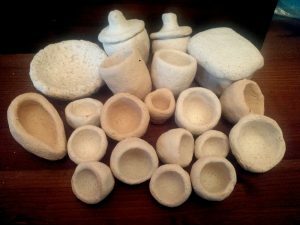 Recipes typically call for powdered minerals or furnace accretions that (unknown to the ancients) contained zinc, and use a “cementation” process to combine the metals – very different to the way that metals are usually melted together to form an alloy. Various names are used for the ingredients of these recipes, and where I’ve struggled to understand them, I have referred to book five of Dioscoridesii, which was written much earlier in history, but provides a useful glossary. There’s plenty of information to unpack in this recipe. First, the type of copper is called caldarium – broadly speaking, a copper used for making cauldrons, which could be refined copper, or could be a range of alloys containing lead, tin, and other metals. What we can be sure of is that it doesn’t contain much zinc at the beginning of the description – the purpose of this recipe is getting zinc into the alloy, which will enhance it’s colour, and make the alloy less prone to soaking up oxygen when molten (a problem with pure copper, as it has an affinity for oxygen). The caldarium is hammered out, and made into sheets. This increases the available surface area of the metal, which speeds up the process considerably. The sheets are spread out “on the bottom [of a pot]”, and sprinkled with “white cadmia”. In this context, cadmia is clearly a zinc-bearing compound, but not all descriptions of cadmia are so reliable, as we shall see later. There is then the instruction to “lute the furance thoroughly”, which is a little confusing. Typically, you would would expect the copper and cadmia to be luted into a vessel, which is placed in a furnace, so there may be some confusion here over what is being sealed – the vessel or the furnace . It’s worth noting that there is no discussion of fuel in this recipe. It is usual to put charcoal or some other organic material inside the sealed vessel, to create a reducing atmosphere, and more fuel around the vessel, so that it can be heated to an appropriate temperature. For example, #18. According to Dioscorides, armenium is similar to chrysocolla, which is usually a copper compound, and the translators suggest copper carbonate. Zonitodos is less clear. Dioscorides does use the name zonitos for a zinc compound, and in any case, cadmia is mentioned here in its own right. This could, potentially, be a sort of smelting process, intended to reduce the compounds to a metallic state. The reference to copper is more suggestive of alloy production. Cadmia itself isn’t that reliable as a term, unfortunately. #125 definately isn’t a recipe for brass, but the description of cadmia is clear – “from the upper part of the furnace”, which is consistent with accounts of artificially produced zinc compounds. However, it exposes the confusing nature of cadmia, which could simply be a name for anything scraped from the inside of the furnace. Lead compounds seem likely in this case, and Dioscorides mentions lead compounds as an alternative for the zinc oxide that he calls spodium. Another reference to cadmia appears in #9, which is a recipe for gold, apparently, despite describing 2 parts of copper for every one of gold. Zinc would improve the colour of the alloy (which would otherwise be very red). Here, it says “…cadmia or Trachian stone – it is yellow and laminar, ie. flat or milky…”), which seems to describe a mineral, with cadmia either as an alternative to it, or a synonym for it. I’ve been experimenting with modern 9ct red gold alloys recently (37.5% gold), and even a tiny quantity (<1%) of zinc improves the working properties of the resulting alloy, as well as shifting the colour towards yellow. The recipe follows on from #8, “A recipe for gold”. A recipe with similar instructions is #28, but this time it seems to be enriching an existing brass alloy. However, without knowing the identity of demnas, which is the largest individual ingredient in the recipe, it is hard to be sure. With a mention of both brass and cadmia, zinc seem certain. This recipe follows on from #26, “A doubling of gold”. It might seem odd to talk about brass in connection with gold, but in many of these recipes, the notion of fakery is important. Mappae descends, in part, from the Leyden and Stockholm papyrii, which each provide a forger’s handbook, with exhortations to keep the secrets, and deceive the artisans who will buy the resulting alloys, which are called asem in the papyrii, though the word does not appear in Mappae. Thorough discussion of Leyden and Stockholm will have to wait for another article, but in brief, asem refers to gold, silver, electrum, and anything that looks like them. Passing various inspections, including the experienced eye of the artisan, was important. This reference to “proven gold” has the same character, and it is here that an alchemical link becomes apparent, because there do seem to be some recipes that turn base metals into precious metals. OK, so the “golden” colour of brass is the colour of a low-carat alloy, rather than the rich, deep (and almost nauseating) yellow of fine gold, but it’s enough to pass muster for most people. Despite this supposed alchemical power of zinc, is every copper-to-gold recipe about brass? The practice of changing colour is an important aspect of medieval metalwork, whether providing a metallic layer (eg. Gilding and silvering), or faking it. As a metal, copper has a unique red colour, which can be modified by alloying it with other metals. Zinc, as we know, provides a golden colour. Tin gives a brown to white, depending on the copper-tin ratio. There is also arsenic (usually in the form of the compound orpiment in Mappae Clavicula) which produces a white alloy with copper. In practice, ancient alloys tend to be mixtures of more than two metals, even if the trace elements are ignored. The characteristics of the resulting materials can vary considerably, and the artisan might need to change not just the colour, but also the working properties of the metal – how it melts, how it flows, how strong it is when cooled, and whether it can be forged or not. Various stages of refining the alloy or adding other metals could take place before the desired result was achieved (pictured are some of the experimental ceramics that Graham Taylor has recently made for me, which are being used to recreate some of these operations). In conclusion, brass and zinc compounds are regularly mentioned in Mappae Clavicula, but there is a only a single recipe for producing copper-zinc alloys. This is suggestive of a context in which brass production is known, and the resulting alloys and compounds are used as additives for later metallurgical operations. That said, the text reveals little depth, despite its origin in the eastern Mediterranean region, where brass was produced in quantity during antiquity. The instructions are garbled, and most of the recipes could be served by local markets rather than metallurgical practice. 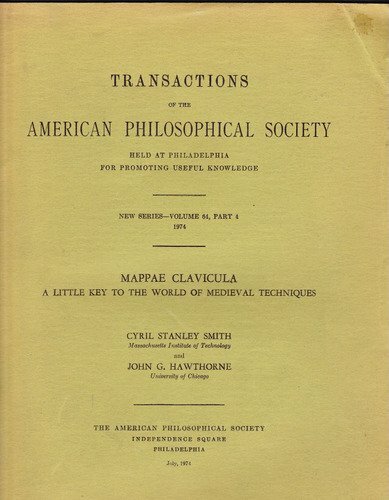 iSmith and Hawthorne, Mappae Clavicula – A Little Key to the World of Medieval Techniques. iiDioscorides, Osbaldeston, and Wood, Dioscorides – De Materia Medica. iiiCaley and Jensen, The Leyden and Stockholm Papyrii. ivPresbyter, Smith, and Hawthorne, On Divers Arts.